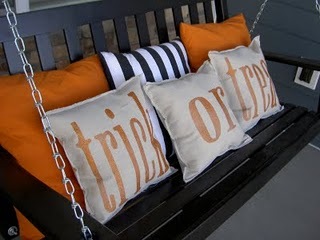 Jessica used glitter spray paint to create these fun Halloween pillows for her porch swing. I might actually be better at sewing a pillow than using spray paint and stencils, but these are cute enough that you should give it a shot. And you don't even need to stop at the fabric store. She made them from a drop cloth that you should be able to find right down the aisle from the spray paint. You can check out her tutorial over at Chapman Place. I love that set up! 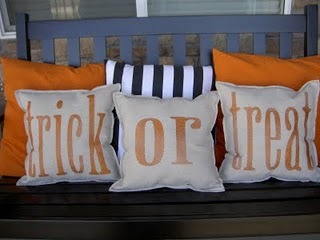 The pillows are adorable & the black and white striped one really pops! !